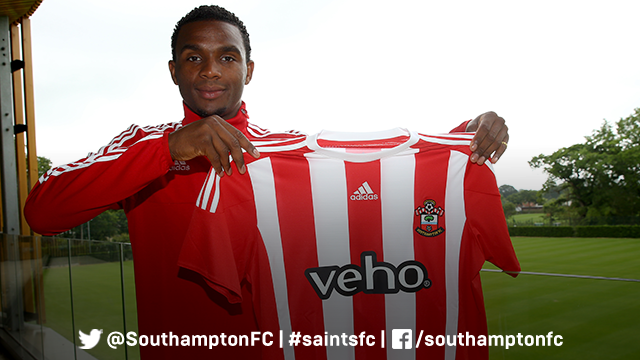 25 year old Rhuendly Martina, more well known as Cuco Martina, signed a two year contract with Saints on the 7th July. He is the first Curaçao International to play for the club. Born in Rotterdam, Martina’s football career began with Dutch second tier club, RBC Roosendaal in 2008. He made 68 league appearances for the club, scoring twice. At the end of the 2010/11 season, RBC went bankrupt and were relegated to the lowest level of football in the Netherlands. Martina left the club and joined RKC Waalwijk in July 2011. In his time with RKC Waalwijk, Martina gained his first international call-up with Curaçao. He won his first cap on 3rd September 2011, playing for the full game as Curaçao lost 5-2 to Antigua and Barbuda in a 2014 World Cup qualifying game. He recently represented his country in June, captaining Curaçao in a goalless draw with Cuba. During his first season for RKC, Martina made 23 appearances and scored once, the club were then managed by Saints current Assistant Manager, Erwin Koeman. His form earned him a move to FC Twente, who went on to finish third in 2013/14. However, his first season with the club was split between 16 first team appearances and 11 games for the club’s reserves. During that first season Martina played alongside current Saints midfielder, Dušan Tadić. Last season, Martina played all bar two of FC Twente’s league matches, also captaining the club in Europa League qualifying.